This page records what I have been able to discover about the use of paperfolding by Friedrich Froebel and its development within the Kindergarten movement. I do not read German and have been unable to access many primary sources. These notes should therefore be treated as incomplete. Please contact me if you know any of this information is incorrect or if you have any other information that should be added. Thank you. 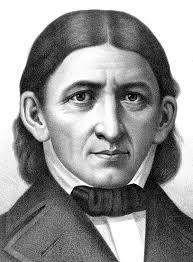 Friedrich Froebel, born 1782 and died 1852, was an educationalist from Thuringia, now part of Germany, who developed a theory of education through both teacher directed and self-directed play and founded what became known as the Kindergarten movement. He, and his collaborators and followers, developed a series of 'gifts' and 'occupations' which could be used as the basis of learning and education. The names and numberings of these gifts and occupations are not consistent across the Froebelian literature, but they normally included several involving the folding of paper, ie paper weaving, paper cutting, the folding of paper strips and the folding of squares, rectangles, triangles and other shapes, including circles. The latter occupation / gift was usually referred to just as paper folding and is the one of most interest to the historian of paperfolding. In 1826 Froebel published 'Die Menschenerziehung', in English ''The Education of Man', outlining the principles and methods in use in his school at Keilhau. The 'Education of Man' does not contain an outline of the system of gifts and occupations that later came to characterise the Kindergarten movement. However, in his notes, interpolated into the text of the English translation, which was published by D Appleton and Company, New York in 1908, W N Hailmann states that 'In a weekly journal which Froebel began to publish in 1850, a System of Gifts and Occupations , similar to the one now used in kindergartens is described.' Hailmann himself enumerates four categories of occupations, Solids, Surfaces, Lines and Points. Paper-folding forms part of the Surfaces category. I have not been able to access the original journal entries that Hailmann refers to. In Froebelian practice the occupation / gift of paper folding was usually divided into three categories, which again have differing names in differing sources. These were geometrical paperfolds intended to impart mathematical understanding and knowledge and can be very simple, or quite sophisticated. I have not made a detailed study of this category of paper folds. These were geometrical paperfolds that seem to have been intended to foster creativity and the appreciation of symmetry as a source of beauty. I have not made a detailed study of this category of paper folds. The original folds of beauty were mainly square symmetric patterns developed from the blintzed square or the windmill base, usually without the use of cuts, but as time went by other starting shapes were used and the use of cuts seems to have become more frequent. These paperfolds were also used as tiles to create larger patterns. Many albums collecting together folds of beauty can be found in museums and collections all over the world. These were paperfolds that were designed as / could be interpreted as day to day objects that children would be familiar with and were used in conjunction with appropriate stories and songs. A detailed study of this category of paperfolds is on-going. Froebelian education lays emphasis on originality and creativity and encourages children to find things out for themselves. Froebelian paper folding was therefore exploratory as well as didactic. The possibilities inherent in the various basic configurations of the paper were explored and new forms were discovered. These were named and passed on and became an intrinsic part of the repertoire of Kindergartens across the world. It is difficult to track this development and dissemination, which probably took place largely by word of mouth, but was occasionally recorded in books. This makes it difficult to know whether, and to what extent, any of the paper folds in the Froebelian repertoire pre-dated Froebel himself, or were possibly even his own inventions. Eleenore Heerwart, writing in her 'Course in Paperfolding - One of Froebel's Occupations for Children', first published in 1895, says (from section 1 of her book), 'Before paper-folding became a so-called Kindergarten occupation, and even before Froebel's time, it was an amusement in nurseries, and in the homes of the rich and poor, grandmothers and nurses made boats and windmills, salt-cellars and such-like to amuse children. Although Froebel wishes to see old and young occupied together, he makes the mere amusement into an education means ...'. The only other mention of a paperfolded object that I can find in Froebel's own writings (there I understand that there must, of course, be many more) is on page 83 of 'The Mottoes and Commentaries of Friedrich Froebel's Mother Play', published by D Appleton and Company, New York in 1895, which is a rendering into English of a work by Froebel first published in German in 1844. The English text contains the sentence 'Hearing the sound, out runs a little boy with his paper windmill. It turns faster and faster as he increases his speed.' This is presumably a reference to the Cut and Fold Paper Windmill. Most chapters on paper folding in the Froebelian literature follow a similar pattern when setting out examples of folds of objects. 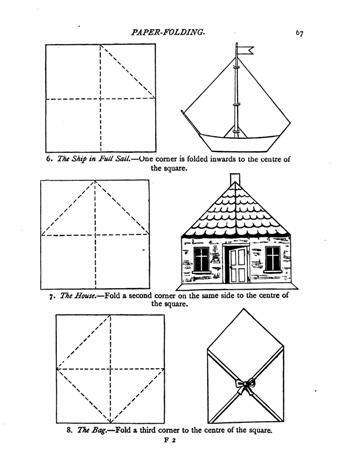 They fall into four categories, very simple folds, folds developed by blintzing or partially blintzing a square, folds developed from a doubly blintzed square or from the windmill base, and folds developed from the triply blintzed square. The blintzed square, doubly blintzed and triply blintzed squares are seen as starting points for development and experiment. Heerwart (op cit) calls the sequence of single, double and triple blintz folds the first folds and says (from section 9 of her book) 'Froebel has described the first folds fully in his work ... never thinking how far these few hints would lead to in the course of years.' Unfortunately I cannot locate the section of Froebel's writings that Heerwart is referring to here. An example of such complete simplicity can be found in Kate Douglas Wiggin's and Nora Archibald Smith's book, 'Froebel's Occupations', published in 1896. 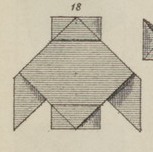 Here, folding a square of paper in half edge to edge is called the first fold, and the design is then interpreted as a book or a roof (page 219). Adding a second crease in the alternate direction, the second fold, and pinching it up a little on both folds allows the design to be interpreted as a hanging basket or a parasol (page 220). Some books also contain other designs which do not easily fit into this developmental system. 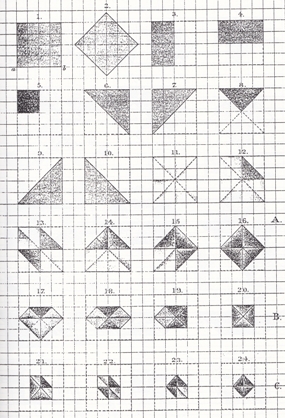 For instance Plate IV of Heerwart's book (op cit) also shows a way of creating an XYZ form from three slit squares and nets for folding the various platonic polyhedra. 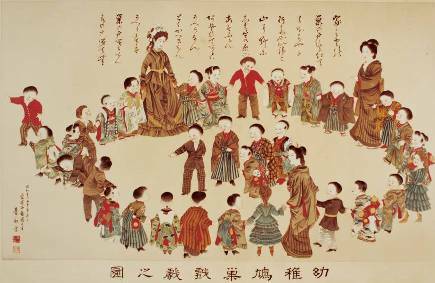 The first Japanese kindergarten was established at the Tokyo Womens Normal School (now Ochanomizu University) in 1876 by Clara Zitelmann, a trained German kindergarten teacher, who had gone to Japan to marry her fiancee Hazama Matsuno. Hazama Matsuno had met Clara while accompanying Prince Kitashirakawanomiya on his studies abroad and it is possible that it was he who had suggested that she undertook kindergarten training before joining him in Japan. Clara Matsuno, Fuyu Toyoda and Hama Kondo playing the Pigeon's Nest game with Ochanomizu University Kindergarten children. And, presumably, the 'occupations' and Froebelian paperfolding as well. In his article 'History of Origami in the East and West before Interfusion' in 'Origami5 - Proceedings of the Fifth International Meeting of science, Mathematics and Education' CRC Press, 2011, Koshiro Hatori writes: 'Many of the European origami models recorded in Kraus-Boelte's book (meaning Maria Kraus Boelte and John Kraus 'The Kindergarten Guide' volume 2: 'The occupations') are not included in contemporary Japanese records. The pig, house, sofa (also known as piano or organ), balloon (waterbomb), arrow (paper plane), salt cellar (cootie catcher), bird (pajarita or cocotte), and windmill ... were all born in Europe and imported into Japan along with the Kindergarten system.' - thus creating at least part of the 'Interfusion' of the article title. It is tempting to wonder if this process went two ways and if traditional Japanese folds might have been 'interfused' in the opposite direction through the Kindergarten movement..
A hint that this is possible can be found in Kate Douglas Wiggin's and Nora Archibald Smith's 'Froebel's Occupations' page 235, in the chapter devoted to Paper Folding, 'The wonderful dexterity and inventive powers of the Japanese children are again shown in these specimens of work from the Empress's kindergarten in Tokyo, which have before been mentioned.' The previous mention (on page 176) referred to a picture of Mount Fuji woven from paper strips and it is not quite clear if the author's are saying that they also received paper folded models in addition to this.